Perhaps this production’s biggest drawcard is the chance to see Alison Whyte finally take on the role of Lady Macbeth, one that seemed a natural progression from her star-making debut as Abigail in MTC’s 1991 production of The Crucible. Sadly, she was off shooting a film on the night we saw it, and the role was taken up by ensemble member Elizabeth Brennan. It’s a significant shift – given that Whyte is considerably older than the actor playing Macbeth (Nathaniel Dean) and Brennan is considerably younger than him – with massive implications for the power and gender dynamics that follow. Of course, as often happens when one drawcard withdraws, another is waiting in the wings to take its place, and Brennan equips herself admirably as the “fiend-like queen”. In an uncanny echo, she recalls Whyte’s turn as Abigail, breathlessly sexual and impatiently ambitious. 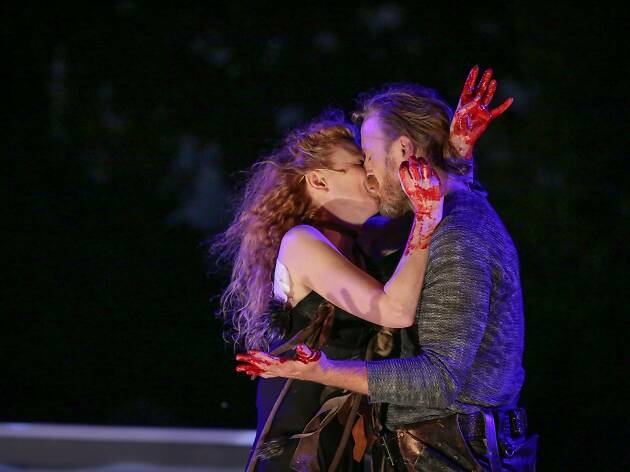 There’s been a decided interpretive re-evaluation of Lady Macbeth in recent years, a trend towards a more humanistic, empathic reading of the role that may make her more psychologically relatable but seriously undercuts her dramatic effect. Brennan falls into this trap to some extent; her command to the spirits to fill her “from the crown to the toe top-full of direst cruelty” clearly fell on deaf ears. The upshot is that her mad scene becomes unambiguously tragic. Dean is a formidable Macbeth, his rasping vocal delivery perfectly touching on the character’s desperate hoarseness of the soul. Some of his soliloquies suffer from an excess of physical energy, a kind of restless pacing that dilutes the poetry’s power, but some are among the best I’ve heard. In particular, “Is this a dagger,” and “Tomorrow, and tomorrow and tomorrow”, are both incredibly potent and moving, driven by a man who mourns the loss of his humanity even as he pushes the last of it away. It’s Shakespeare’s hardest part, and he proves himself worthy of it. 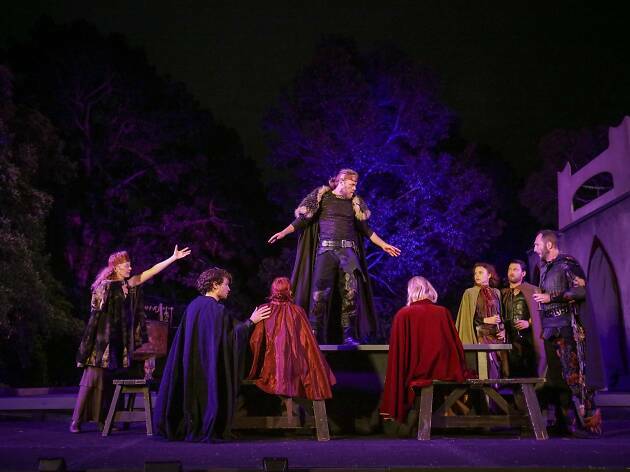 The rest of the cast, as is often the case in Australian Shakespeare performance, is painfully uneven. Utterly convincing performances – from Dion Mills’ magisterial Duncan to Adam T Perkins’ phlegmatic Ross – rub up against some total duds. 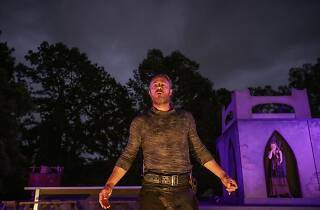 Kieran Clancy-Lowe manages to make Banquo both wooden and over the top, and Australian Shakespeare Company stalwart Kevin Hopkins is woefully miscast as a charisma-free Macduff. Why Perkins wasn’t cast in this role, which needs stature and gravitas to match Macbeth’s great murderous intent, is beyond me. The witches (Annabelle Tudor, Madeleine Mason and Syd Brisbane) are curiously effective, given their pantomime costumes and commedia dell’arte performance style. It’s a salutary reminder to directors who tend to overthink the witches that, when in doubt, just get out of the playwright’s way. Which brings us finally to director Glenn Elston, who’s been plying his trade in these gardens for 30 years straight. 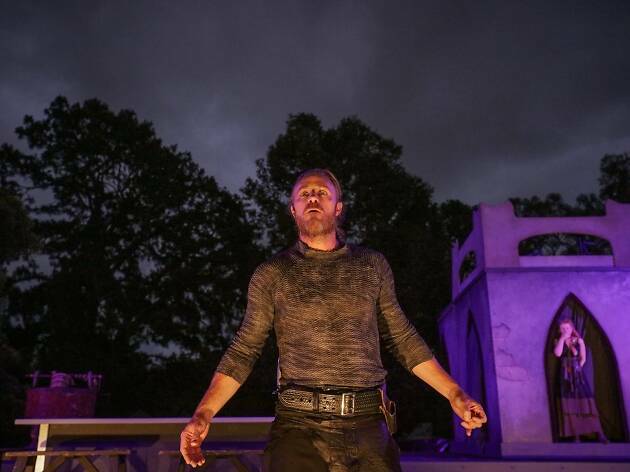 Outdoor Shakespeare tends to the rough and ready, high on rambunctious energy and low on nuance and subtlety, and Elston’s is no exception; if anything, he plays to the crowd in a way that always seems nakedly populist, and sometimes to the disservice of the play. He reins that tendency in here – although his actors still plow through the text as if they’re frightened the audience might start listening to the poetry – and the result is strangely powerful. 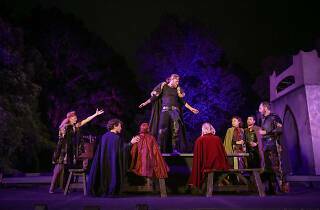 When Macbeth tells us that “night’s black agents to their preys do rouse”, and we hear the screeching cry of bats behind us, it seems Shakespeare might truly belong in the park after all.